SKILL AND COMPASSION, need to go hand in hand when providing EXCEPTIONAL patient care. As dental professionals, we stay up to date on the latest advancements in dentistry in order to provide the most current treatment options for our patients. As doctors, we recognize that our patients are unique individuals who have placed a great deal of trust in us and our team. That is just one reason why we value each and every patient relationship. We appreciate the time you’ve taken to visit this site and find out more about our dental practice, our team, and the many services we can provide to help you achieve OPTIMUM ORAL HEALTH! Dr. Geoffrey B. Robinson was born in 1984 and was raised in the Temecula Valley in southern California. He attended Grade School locally and High School in Minnesota and at Calvary Murrieta. He continued his undergraduate work at the University of California Riverside. He completed his Doctor of Dental Surgery (DDS) degree at Loma Linda University in 2012. He is a member of the American Dental Association, The California Dental Association, and The Tri-County Dental Society. Dr. Robinson was married in 2011 to Natalie, who is a physician in Riverside, California. They met at Loma Linda while Geoff was in Dental School & Natalie was in Medical school. 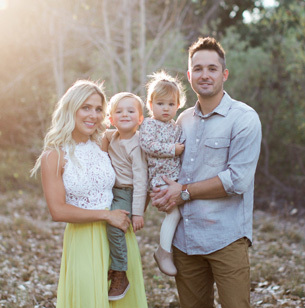 They currently live in the Temecula Valley, with their 2 children, Wyatt and Everly. Dr. Robinson, loves sports, and played many years of Ice Hockey. He is a car enthusiast, and enjoys spending time with his family, and the “occasional” game of Golf.